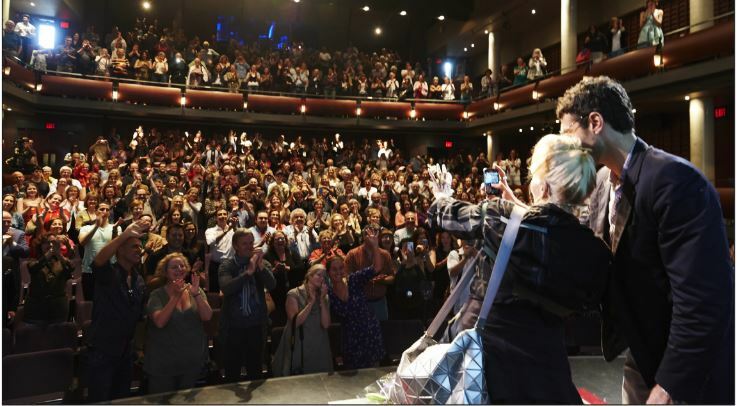 There was really nothing quiet last night at Joni: A Portrait in Song and A Birthday Happening Live at Massey Hall when Joni Mitchell came up on stage. It showed that her voice has never ceased to enthrall audiences and is more important today than maybe ever before, especially in times where pop music seems to be reduced to hook line after hook line that just follow each other like people on an Escher staircase: constantly climbing but never getting to the top. At our Chamber Magic Show at the George Brown House the other day one patron gave one of her diamond earrings to Steve Cohen for a magic trick and he made it disappear and reappear on a photograph by Liz Taylor but it would not come back. We are trying to contact the estate now to see whether this earring was or was not sold in the Christie's auction in 2011 but are not too hopeful about getting it back. One of Ronnie Burkett's marionettes, an elderly German Nazi officer who is trying to shut down the Daisy Theatre was heard yesterday repeatedly ranting about high culture and also the artistic director of this festival who happens to be German as well. The artistic director came up on stage and tried to explain to the Nazi officer that he does not believe in the distinction between high and low culture but only good and bad art and The Daisy Theatre was obviously good art. He was not amused and threatened to close down the theater if Ronnie Burkett would not continue with a striptease act. He did, it was an overwhelming experience and all the men in the audience stormed the stage to applaud her. This article has been viewed 2,650 times since being added on June 26, 2013.